THE HGA-M is a very unique device that provides low to high humidity air mixture with H20. The maximum power is 1KW for this unit. High temperature superheated mix of steam-air or steam-gas output. The high humidity steam/air mixtures will have varying temperatures depending on the mix. Please review unit features in the adjacent tab. Superheated steam is an odorless high temperature gas (not to be confused with hot water mist). OPUMP-1 for metered water flow is a required option. Several options available and recommended. Size envelope is ~18″ x 2″ Diameter without legs. Safety precautions must be taken when dealing with hot gasses including steam. Safety: PLEASE DO NOT USE UNIT WITH or OUTPUT ON COMBUSTIBLE LIQUIDS. DANGER OF SUPERHEATED STEAM SHOULD BE WELL UNDERSTOOD. PLEASE USE GLOVES, GLASSES AND HARD HAT. PROTECTIVE CLOTHING REQUIRED. STEAM CAN PENETRATE CLOTHES. Patents applied and pending. Installation: Installation and use manual provided with product. Air flow generator is in user scope. 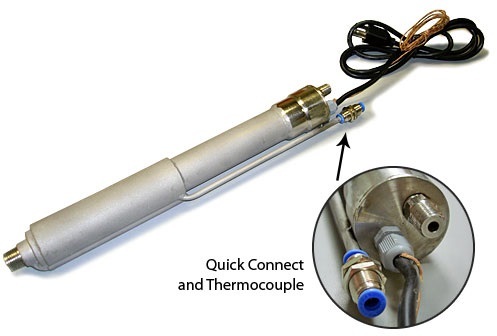 Options: Control thermocouple for the hot air generator part is included. Steam output temperature thermocouple and bracket is sold separately or user may provide their own on their part. Electrical 110-120V 50/60Hz supply required for this unit. 1KW system requires compressed air input. Typical Use: Is everywhere where high temperature and high humidity steam is used such as drying of ceramics and sanitation. Use also for process simulation with low price steam unit. For unit replacements please contact MHI directly sales@mhi-inc.com with the serial number. Potential uses: For drying, cleaning, layering, epoxy drying and other film uses where superheated steam is required at one atmospheric pressure. Ideal for steam drying or steam oxidation. Product has uses in surface technologies, cleaning technologies, drying technologies, curing technologies, nano technologies. Attempt use also for precipitating crystals of several small sizes including nano crystals from solutions. Precipitation droplet sizes may be controlled by controlling rate of cooling, impingement conditions and type of surface. High Humidity Control: Steam temperature and the relative mass of moisture in steam-air mixture (specific humidity) depends on water valve setting and air inflow setting. This unique device can give more than 40% specific humidity at temperatures greater than 100C (compare with a specific humidity of less than 3% in fully saturated air at room temperature i.e. air with RH=100%). Air 1.45CFM (inlet at ~30C) and water 250ml in 45 mins (inlet ~30C) yields steam-air temperature of about 450C. Air 1.45 CFM (inlet at ~30C) and water 330ml in 45 mins (inlet ~30C) yields steam-air temperature of about 350C. Air 1.4CFM (inlet at ~30C) and water 200ml in 20 mins (inlet ~30C) yields steam-air temperature of about 250C. Air 1.8CFM (inlet at ~30C) and water 200ml in 20 mins (inlet ~30C) yields steam-air temperature of about 150C. The user is required to provide air flow device from a compressor or gas bottle and regulate the flow with a flowmeter. The unit come with a manual which has comprehensive valve setting data for the water (manual available only with purchase). These setting may vary with use and other conditions. The values above should be considered as approximate. Your results may vary with unit and the type of use. Q: When do you dry with steam instead of drying with hot air? A: There are many benefits to using steam but the main one is the availability of a gas with a lot of stored enthalpy at a lower temperature than corresponding dry air with the same enthalpy. So if you were interested in drying paper which has an ignition temperature of say 450°F, then the use of superheated steam at a much lower temperature may produce the same drying efficiency as hot air at a high-temperature which could be in excess of the paper ignition temperature. Q: Is steam drying energy efficient? Is it better? A: The answer is YES in many applications. Compared to boiling in hot water to remove dirt, superheated steam is faster and may not require the subsequent drying operation thus saving you time and money. There is also the possibility that because of the large enthalpy content and higher than 100C steam temperature, the cleaning could be more efficient, reach tough to clean spots, and eliminate more. Detailed installation and use manual provided with product. Some lead time, about 3 to 4 weeks, on this product may be encountered because of the high demand. 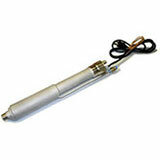 Control thermocouple for the hot air generator part is included. Steam output temperature thermocouple and bracket is sold separately or user may provide their own on their part. Electrical 110-120V 50/60Hz supply required for this unit. This 1KW system requires compressed air input and water input.